Book Texts – Ordinary People: Movie Worker | Ámauteurish! Confession of the week: I was an ordinary movie person. Actually I still am, were it not for the impression that film commentators hold significant influence over the industry – a consensus held by most industry personalities including, not surprisingly, film commentators. But to get to the point: I once actually started wondering what all the hoopla over the position of film critic was. 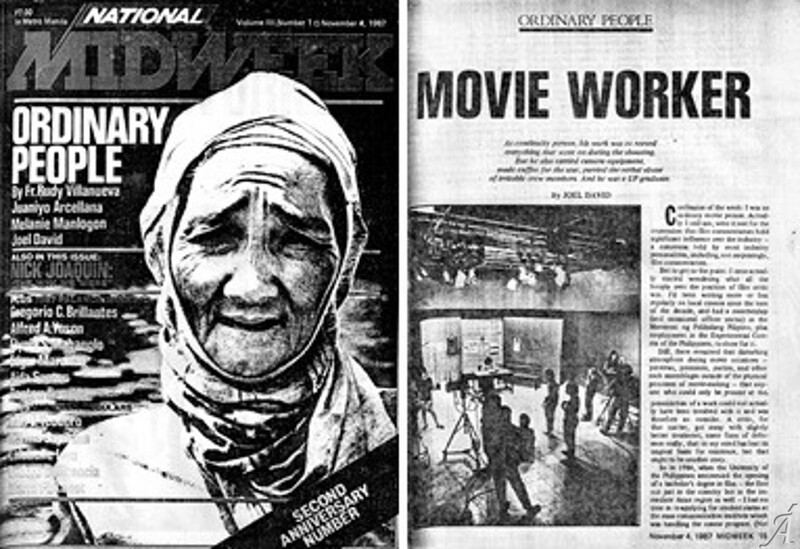 I’d been writing more or less regularly on local cinema since the turn of the decade, and had a membership (and occasional officer status) in the Manunuri ng Pelikulang Pilipino [Filipino Film Critics Circle], plus employment in the Experimental Cinema of the Philippines, to show for it. Still, there remained that disturbing atmosphere during movie occasions – previews, premieres, parties, and other such assemblages outside of the physical processes of movie-making – that anyone who could be present only at the presentation of a work could not actually have been involved with it and was therefore, for all intents and purposes, an outsider. A critic, for that matter, got away with slightly better treatment, some form of deference really, that to my mind has lost its original basis for existence, but that ought to be another story. I had the advantage of holding an earlier degree (journalism, batch ’79) at the institute, plus the determination to finish as fast as possible whatever the cost, and maybe the first batch wasn’t so appreciative of the distinctions in store; they pointed out my exemption from the thesis requirement (already fulfilled by my earlier degree), but I retorted to myself that, unlike them, I had to finish a final individual film project, which the program’s coordinators justified as my equivalent of a production thesis. Anyway there I stood, for more than a year the only qualified film applicant in the history of Philippine education, willing to undergo whatever it would take to make me a part of the movie system at last. What lay ahead, I wouldn’t wish on my worst enemies. A major outfit sounded out a call for assistants in production, and as far as I knew, I was the only one who responded then. More than a month of follow-ups afterward, I finally got in – as an apprentice, I was forewarned, and for the rival of the company I had applied with. An apprentice, I was made to understand, gets free food but no pay, and is responsible for…well, whatever comes up during production. Break a leg then. Someone who took charge instructed me to record everything that went on during the shooting – the blocking of everyone and everything on the set (including the lights), the position of everything that appeared in the camera viewfinder, the lines of dialog, the movement of actors, atmosphere people (a euphemism for extras), and physical objects, not to mention the usual details of date and sequence and scene numbers, location and performer(s) – for which I needed to continually refer to the script, a copy of which was provided me much, much later. Continuity, the job was called, although I distinctly recall carrying camera and related equipment, preparing coffee for a certain performer, and parrying the verbal abuse of several particularly irritable crew members. Plus I had to buy a stopwatch (I borrowed one instead) to time the individual takes, and reproduce as many copies of a certain form on which to keep my records. I finally was able to plead for the reimbursement of the two reams of continuity forms that I had to mimeograph, and the film’s director, who provided me with invaluable recollections of the previously flourishing regional cinema with which he’d been involved, batted for a consolatory sum of money that the producers provided to defray part of my transportation expenses. At this point the creditors, who extended financial assistance so that I could be able to finish my second degree, were impatient for some material results. Without the benefit of clear thinking, I agreed to replace a would-have-been batch mate in a big-budget semi-period piece. As it turned out, the guy and his group mates edged me out in a more substantial fund-raising project, while the movie project I got into got shelved for alleged shortage of funds. To the rescue came the muse I had abandoned. A colleague in writing, now into editing (while I was contemplating the feasibility of going insane), asked me to write for the publication she was handling. On what? I asked. The movies, she answered, since that’s where you’re now. I lay aside insanity for the moment but it arrived anyway in another form. The first production outfit I had applied with immediately after graduation this time offered me a respectable-enough designation in an out-of-town project. By then I was already making twice as much as the offer (which, I was assured, was already somewhat beyond standard rates) just writing for the publication and a television show on the side. When the movie I said no to got released, it made good box-office business and was reportedly its producer’s critical favorite, while the publication I had cast my lot with folded up and the TV show shut down. Hope springs eternal even for those who never learn, but I’ll respect whatever way you interpret that: my alma mater somehow remembered it had an only graduate lying around (close to the literal sense) somewhere, who’d not only be the only academically qualified film worker in the country but also the only qualified film instructor as well. So coming full circle now, what easier way to augment the predictably pitiful (but not for me, you bet) income that teachers receive? Why nothing else, or nothing less, than good old-fashioned semi-scholarly commentary on films. At least, this way I get to torment not only my students but my readers as well, and with a little bit of luck and a considerable amount of self-delusion, even the industry might consider restructuring its professional set-up in lieu of an oncoming onslaught by starry-eyed and financially secure film graduates – and doesn’t that add up quite logically, dramatically even, with this historical era of countless coup attempts? Anyway, till that moment arrives, I’ll be happy where I am. I guess. After a few other (expected) false starts, the production thesis became a viable option in the eventually upgraded College of Mass Communication. Extremely few undergraduate candidates, in fact, choose the research option. This entry was posted on Sunday, April 15th, 2018 at 9:18 pm	and tagged with Profession and posted in Book. You can follow any responses to this entry through the RSS 2.0 feed.